I’m back from my mini holiday. which you may or may not have picked up on me going on, depending on how closely you read my blog. I left last Saturday, and I came back home yesterday (actually this morning at 2am). Today has been weird. I usually feel weird the morning after coming home from visiting my boyfriend, but this was different, because it was our first holiday away together. We’ve stayed in hotels in London before, and he came to visit me last summer and we stayed in my parents’ house while they were on vacation, but this was our first time going away together, properly. Being in a long distance relationship isn’t easy. You’d think it gets easier with time, and the being apart thing somewhat does, but the going our separate ways at an airport never does. It’s the worst feeling in the world, going home but not with the one you love. We’ve been doing this for a year and a half now, and I’m getting really tired of it. I just wish we could live together so that at the end of a holiday like this we’d be going home together, not to separate homes. But with how our situations are now, neither of us are able to move so we’ll just have to keep doing what we do and cope with the suckiness of it all. I want to write a post about Alicante later, when I feel a little more normal than I do at this point. But it’s coming! I want to start blogging more regularly, and in doing so I want to do something my boyfriend suggested, which is this: For a week, I will not post a single thing. Everything I write will be scheduled, a post a day; that way I will create a backlog. It also helps that I have a list of things I want to blog about, that I’ve just written as the topics pop into my head when I don’t have time to write the post itself. Then I will try to keep the schedule going so that I will be posting once a day, and we’ll see how that goes! Good afternoon, readers! It’s been almost a week since I last posted, and I apologize for my absence. I just thought I’d take some time to explain what’s going on in my usually not-ever-busy life. Last Friday I was in uni – I had to come, someone brought cake! Then I had about a dozen errands to run due to being away for almost a week beforehand. I bought a new pillow! And let me tell you – a medium high hotel pillow, it’s the width of my bed, it is like sleeping on a cloud! I had planned to relax and maybe do some thesis work over the weekend, but that didn’t happen as I got a call from work asking if I could come on short notice, something to do with a mix-up of who was supposed to work and also someone being sick, so I had to fill in but yay money! Tomorrow I have an appointment with the blood bank at 1.30. That means I need to get work done before 1pm – which in all likelihood means I’ll not be going to uni tomorrow, but working from home for maybe two or three hours beforehand; I also need to make sure I eat two decent meals before going down there… And in the evening I’m supposed to be going to a social thing with JEF (Young European Federalists) where a woman is supposed to talk about EU for a little while and then we eat pizza and drink beer (or not, since I’ll be donating blood earlier in the day)… but we’ll see how I feel. On Friday there’s girls’ night at a friend’s house at 6pm, which means I need to study earlier in the day and go home and eat and possibly get my wine if I decide I want to drink that. And on Saturday I’m going out of town at 2pm so I need to have packed and bought the things I still need to buy before Saturday which, with the rest of my week, means I probably need to do that today! Which makes me want to just leave uni right now to get that stuff done… but I feel like I need to work on my thesis since I’ll be away from Saturday until next Thursday and I have so little time left to do things! Anyway, that’s my rant of the day! How’s everyone doing this week? I’m writing this from my new phone, the Huawei Honor 8, which arrived yesterday! I will write a reviews of it when I’ve used it a bit more, which was actually requested, and I’m keeping a list in my journal that I write as I go, but I want to use it for a week or two so I have a bit more experience with it, and maybe some negatives will pop up as well, but for now I’m loving it! Today I wanted to write a little something about milestones, more specifically about birthdays, which popped into my head while I was on Twitter just now (follow me here). Three days ago, I was exactly 24.5 years old. But it hit me that I more often think of myself as 25 than 24, which is something I’ve never done before. I usually struggle to remember how old I am for weeks after my birthday, but I don’t think that’s be a problem this September. And I started thinking about why I feel this way. 24: not a big one, but to me this marks the beginning of your mid twenties (20-23 being early, 24-26 being mid, and 27-29 being late). 21: not a big one in my country, but to me this meant that I could now legally drink in the USA. 20: Finally not a teenager anymore! And for me and my fellow Norwegians, this also meant that we could buy all kinds of alcohol, not just below 22%. 18: this is probably the biggest. You can buy alcohol (up to 22% in my country), get your driver’s licence, vote, and make all your decisions because you are legally an adult! 16: another not-so-big, but in Norway this is when you can start practice driving with an adult and also get your moped licence. 13: you’re finally a teenager! You probably wanted for this one for a while, feeling like it took forever to get here, and having already gone through (at least some of) puberty. And I guess that’s it for the list. 25 is mostly considered a big day around the world though, I think. But I know a lot of people dread it because it makes them feel old. But it doesn’t scare me – I already feel it. What do you think? Got any thoughts to share on birthday milestones? Good morning to you, wonderful reader! It is Wednesday morning, nearly 11pm, and I’m sat on a couch in my parents’ living room. I was supposed to go back to the city Monday morning, but on Sunday night we heard that the wind had grown stronger and found out that we were going to have a little storm, wind-wise, and although we didn’t get any notifications about the ferries being cancelled I didn’t particularly want to go out on the water in wind that strong, and especially not after my mom told be about one ferry that had a window taken out by a big wave not long ago. So I decided to stay here a little longer. Just as well, actually, because on Sunday I ordered my new phone, which I mentioned in this entry here. It said it would arrive in 1-3 working days, so we were hoping it would arrive yesterday, but when dad came home from a work trip he said the tracking said it’s in the city and therefore he thought it’d be on the first ferry out to our town today. He’s the one who’ll get the message about it though so I just have to wait… I did get a few other things done the past couple of days as well, so my time here hasn’t just been an extension of the weekend; yesterday I had a dentist appointment (and was told everything looks great), and I went with my mom to a meeting about noise reduction/isolation of houses, because our town is right next to an air force base which is getting new F35 fighter planes which will make a lot more noise than the F16s I grew up with. On Monday, I felt that I did good work wise. I wrote three paragraphs on my methodology chapter, and sent it in to my supervisor (it was 6 pages long, not finished, but he’s been asking for it). Then I wrote about 600-700 words more on my literature review, which still needs about 8 more pages before it’s finished, but I’m getting there, and that one doesn’t need to be finished before the end of April when my supervisor will get my entire thesis, all chapters put together, for one final reading. So I felt good! That was until my supervisor sent back the methodology chapter with his comments yesterday. I read the email, and then all the comments on the chapter. Then I started to cry. My 16 pages long literature review needed to be restructured (which actually means rewritten, because most of the parts had to be changed as well, not just moved around), and rewriting makes it shorter, but it needs to be about 20 pages long, so I need to write more. That should’ve taken about 2 weeks, he said, and I’m sure I could have done it if each day consisted of about 40 hours instead of 24, but it doesn’t, so I’m not finished. And now my methodology needs to be rewritten, clarified, a lot of stuff needs adding and explaining… a friend of mine told me to remember that I’d written it in a hurry so of course it wouldn’t be great, and another told me to just go into robot mode and get stuff done, and my ever-supporting boyfriend told me I always react like this, I just need to remember that I’ve always been fine in the past and I will be fine this time too, it just feels like I won’t because it’s my master’s thesis. My mom told me that it sounds like I just need to sit down and work. And here I am, blogging. This entry has passed 600 words by now, so I know I am capable of writing lots of words fast, so how come everything on my thesis is going so slow? I think I know the answer to that. I don’t want to write it. I don’t want to do the work. I just want to get the degree so I can move on with my life. I’ve been in school for 19 years, that’s 3/4 of my life, and the 6 years before that I can barely remember, apart from some glimpses here and there. They say that university, the years spent as a student, are supposed to be some of the best of your life. But they’re also the most stressful. I constantly have the feeling that I’m not quite done for the day because there’s always something that needs doing, because you’re never done, but you can’t spend all your awake hours working, either. But when I’m not working I feel guilty. And then I struggle to work because I feel so bad about myself. And then I feel like I’m stuck in this vicious circle that I can’t get out of, I cannot see the light at the end of the tunnel, everything is just black, the air is black, and it’s pushing down on me and I can’t breathe and I just want it all to end. That’s how it feels, a lot of the time. That feels like what life is all about… And I know it’s temporary. I know there will come a time in my life when it’s not all about studying and getting my degree, or the next degree. But here’s the thing. I have some certain destructive tendencies, which make it to the surface despite me working on burying them as far down as humanly possible, sometimes. Next, eating. When I was younger, I didn’t eat much. I went through a period a couple of years after I stopped eating meat where I noticed I lost a lot of weight and it became an obsession to lose weight and at a point I pretty much only ate dinner with my family because that was mandatory. Going to America for a year when I was 17 helped a little. But what helped the most was starting exercising when I was 19-20. Most of the time I eat good, and a friend of mine started calling me a hobbit, because I am short and I eat very often! But sometimes I slip up. Last week I had one of those. I’d even brought lunch with me when I went to a friend’s house to work for the day, because the last time I did that I didn’t eat enough throughout the day. But I didn’t eat dinner that day. I was so hungry when I got home, but my roommate was cooking and I didn’t want to intrude so I sat down. My two roommates and I talked for a couple hours but my headache, which arrived after the gym, was getting so bad, and because I didn’t eat right away I got nauseated and couldn’t eat. So I took a shower and went to bed. My actions were very noticeable the following day, with more headaches and extreme hunger, a so-called “hollow day”. And then I sleep. And tomorrow, I have to get up and do it all over again. Anyone else experiencing anything like this? I’d love to hear from you! Do you want to know a secret? I am a sucker for makeover programs on TV! And there are a lot of them. Usually they’re broadcasted in the daytime, which is a time of day I never watch TV, and I also don’t own a TV so everything I watch is on streaming providers, and then I usually watch series such as Friends, The Big Bang Theory, Criminal Minds, Blindspot, Grey’s Anatomy… you know, shows and series with actors, not reality anything. That’s when I’m in the city. When I go home, I spend a lot of time with my mom in the living room and we watch daytime TV. Even if she’s not around, I tend to spend time in the living room with the TV on if I’m working on my laptop or just relaxing. We watch a lot of shows, often British, some Norwegian, where people are selling or looking for new houses, or renovating theirs, or where people have tried and failed to renovate and then seek professional help… As well as garden/garden making show. Right now we’re watching a show where a bunch of professionals fix up a house that a family inherited that was well suited for the grandmother who lived there before but not for this family of four, and now the host has sent the family away and they’ve started changing the house, and the host keeps sending the family small video clips of them tearing down walls and such! I think what I enjoy so much about shows like this is seeing all the transformation that’s possible to do, to know that even something so permanent as a wall in a house isn’t necessarily permanent. And I would just love the opportunity to wear carpenter’s pants and attack a wall with a sledgehammer sometime! Anyone else secretly or not-so-secretly love makeover shows? Two posts in one day – what a treat! Well. Depends on whether you like long rants and text that’s not accompanied by any sort of pictures. Anyway. Like I said in my previous post, I’ve spent this weekend with my parents and brother in my childhood home. I also said there were four reasons why I went home, not counting the fact that I like spending time with my family and given the options of doing that or sitting in my bedroom in the city, there wouldn’t even be a discussion on which one I’d choose. My last post was about one of the reasons I went home, this one is another (or, at least part of it). I needed to get my swimsuits. Bikinis. Two-piece swim suits. Beach wear. Whatever you call it. The stuff you wear to the beach when you want to go swimming. I needed to pick up some of that, and I knew I had several here. One of them, a very patterned bikini from a few years ago (read: 7 years ago), was completely ruined. The elastic in the waist on the bottoms and the part you tie around your body on the upper half was completely gone, probably due to bad washing after swimming pools and lakes and oceans. So that had to go in the trash. Next up was a purple one with white polka dots, bought at the same time, but used less. That one had a safety pin put in on the side of the bottoms to hold it together. I removed it, and the bottoms fit better than they ever have (I should mention that I probably weigh more but I am a lot happier with my body now than I was a few years ago and I know I’m healthier than I was when I bought these). GREAT, I thought, I have bottoms that fit. The top however – can I just say OW! Much squeeze. So ow. Not very nice looking – or comfortable. This one used to be too loose, just like the bottoms, but the bottoms now fit and the top is too tight. Oh well. Next bikini. I found a dark blue bikini I also bought a few years ago, although I don’t remember when. This is the kind where you have to tie everything, and a naughty person pulling on one piece might make everything incredibly awkward for you. And what do you know – another bottom that both fit well and looked good! The same situation happened with the top here, which also had the same style as the previous one… However, I was in luck – my mom had given me a top that didn’t fit her that was exactly the same color, and that one wasn’t so bad! At least I can wear it without being squished. But I would worry about it falling off, going up or down… Either way, moving on. I have a bikini top that I bought less than two years ago to wear at home with shorts if it got incredibly hot that summer – it didn’t. The top was only ever tried on in a fitting room where I decided it looked good. Who knew that breasts could change size so quickly in your early 20s, when you haven’t really changed much else in your life? Back then, I’d been working out quite a bit. I’d gone from a B cup to a C cup, and down in the size around the body. However, in the last year I’ve gone up yet another cup size, and I don’t know what’s caused this, about 10 years later than you’d expect! Either way, the beautiful top I got a year and a half ago is way too small and going onto my donation pile as it’s not visibly used (as it should be, since I haven’t used it)! That left me with one more set to try on, a tankini I bought about three years ago. Back then I didn’t think I was that unhappy with my body, just that I didn’t like stuff too revealing, but in retrospect I can clearly see that I was not happy with myself at all. This tankini is kinda cool – it has a halterneck top, but from the breasts and down there is a crochet kind of material that covers your body down to your hips. The bottoms are high wasted and cover up all the things I usually cover with jeans, at least in the stomach area. And I’m not throwing this one away – however, it’s not what I want to wear to the beach on vacation now, I want something a little less covered up. So that leaves me with the dark blue bikini from three paragraphs ago. But my mom told me of a shop in the city where they sell pieces separately, in other words the more body friendly way of doing it, and the staff are comfortable and helpful as well. My mom told me to go there, as I haven’t bought anything new in three years (that I’ve used) and I also haven’t gone swimming since then. She told me to indulge myself, to treat myself to something new. So at some point this next week I’m going shopping, and trying to resolve this ever-lasting bikini problem. Anyone else ever experience fashion crises like this? Anyone got any stories they want to share? Good afternoon, readers! I hope you’re all having a good weekend! I’ve not been posting anything because I’ve not been on social media a lot this weekend, as I decided to go home to my parents, for three, wait no, four, different reasons. One of these reasons was phone related. As some of you might remember, in January I wrote this entry about using an iPhone for the first time due to my Samsung having been sent off to check if the things wrong with it were fixable. They weren’t. After several weeks, I was told that I would be able to get my money back after February 1st. It’s now been over a month since then. I’ve been to England in the meantime, and when I got home I was told to call someone but of course they were closed so I had to call the following day, and the woman I spoke to confirmed that it was a warranty issue and I could get my money back. That was over a week and a half ago, and my money is nowhere to be seen. However, today I couldn’t wait any longer, and decided to order a new phone after debating and comparing phones and operative systems for a couple of weeks. I knew that I did not want another Samsung, but I did land on a phone that runs on Android. Not iOS. After almost 6 weeks of using the iPhone, I’ve decided that I just don’t want one. So I decided to write a post about why. Please note that this is not an attack on iPhone or its users, it’s simply personal preference, and furthermore I am aware that some of the things on the following list may be changeable in the settings, but the fact that they’re not already default is a minus in my book. Other issues I’ve been having might be due to the fact that I’ve been using an iPhone 4s, which is old, and newer iPhones may have fixes for these; I’m basing the following points strictly on my experience with this one iPhone 4s, so please do not consider this a review of anything else. The first point on my list is something that I mentioned in the last post I wrote about Android/iOS, and that is the fact that if I write too long of a message in WhatsApp/Messenger (my two most used message apps) the message I’m replying to disappears, and I have to exit the message and go back on it again to see the rest. I can’t close and reopen the keyboard in the same way that I could with my Samsung phone. I’ve been told that newer iPhones have an arrow next to the keyboard that allows for this though, so that might just be the 4s that’s bad. The fact that you cannot insert a memory card is a huge minus for me. You’re stuck with whatever size memory you choose to get, minus approximately 2GB that are used for software (this one is 16gb, available space was 14.2 before I downloaded stuff, I believe). The price of iPhones is ridiculous. I could get the 5s 16gb for a reasonable price, but that was about it. The SE with 64gb is where it seemed like I would be able to get the most for my money, but even that was pushing my budget, and I didn’t like the width/length ratio on the newer iPhones, they looked too long and narrow for me, although I’m sure that’s something you get used to. Going back in apps have been an issue for me sometimes. An example is when I accidentally clicked on something in the Messenger app for Facebook where I could “react” to the last message sent, and I just wanted to go back, but I couldn’t figure out how to and ended up having to give the message a thumbs up before I could get to see what the message actually said. It seems to me that if I’ve been in a game and I’ve clicked the home button and exited the app, when I reopen the app it takes me to the main page of the app (think candy crush saga, where you have the map – that’s where I’m taken, not back into the game). I know my Android phones do that too sometimes but that’s usually when it’s been a long time since I was in the app, and usually I got straight back into the game as I left it when I reopen the app. I’ve missed SO many notifications on this phone due to the fact that I have to pull down the tab at the top to see the rest once I’ve swiped and opened one – you know, when you haven’t used your phone in a while and you wake up the screen and have 5 notifications, and you swipe on one to see it, and then you forget that the rest were even there because when you turn the screen off they don’t reappear. This, I’ve bee told, can be changed in the settings, but I don’t want to have to do that, I think it should be default. Furthermore, on my Samsung phones, I could always see that I had unread notifications at the top of the screen where you see the clock and battery and wifi and signal – there were symbols there telling me what apps I had unread stuff in, which reminded me to pull down the tab and view them, which the iPhone doesn’t. This phone keeps telling me I have unread emails when I don’t. First it was one – and I even clicked my way through all my emails in my inbox (which aren’t many because I keep deleting and moving them to folders several times a day), but it still said I had one unread email. This past Friday, that changed to two unread emails. So now when it tells me I have 7 unread emails, I actually only have 5. I spoke to a roommate of mine who had experienced the same before and it lasted for months before it suddenly stopped. Really annoying! I absolutely HATE that the iPhone turns itself off when it’s cold. I live in Norway, and Norway is cold. I’ll be walking home from the bus stop replying to a message, and it randomly shuts off. This is NOT something I can live with, and the fact that it’s supposed to be a safety feature… to me it’s just annoying and frustrating and I don’t need this kind of stress in my life. What do you mean I can’t connect it to my windows computer and transfer my pictures over to an external harddrive?! Actually, this is an easy fix, I just have to upload them to a Google Drive folder, but that’s not how I like to do things, and I like to keep all backups on this one harddrive of mine, together, so I need to then copy them out of the Google Drive and onto the harddrive which is just an annoying middle step for me. It does not charge properly. And by that I mean that I have to blow on both ends of the charger cable, plus the box, plus the outlet, plus where you plug the charger into the phone, and then, MAYBE, it’ll start charging. My friend told me that’s most likely the cable, because it’s a cheap cable, and she had the same issue with a cheap cable for her 5s, but a more expensive cable works fine. No. That just won’t do. No one is better at breaking phone charger cables than I am, and I expect a cheap cable to charge just as well as a more expensive cable; it may be slower, but it should not do this, and I shouldn’t have to do 7 different things and restart the phone twice before it’ll charge – it should just start charging when I plug it in! So there you have it – my list of 10 reasons I chose another Android phone instead of an iPhone when finally deciding to buy a new one. And let me tell you: no offense, but I am REALLY looking forward to giving this phone back to the friend I borrowed it from! I’ve been a coffee drinker since I was 17. That’ll be 8 years this summer/fall. And in this whole time, I have never ever seen the value in decaf coffee. What’s the point in drinking coffee without caffeine, right? Decaf is for the weak! When I was at my boyfriend’s last month, he bought decaf coffee. And I had decaf coffee. And now, two weeks later, I’m sat here, it’s 8pm, and I want coffee. But I don’t want caffeine because it’s 8pm and I don’t drink coffee at this hour because I like to sleep… And for the first time I’m sat here wishing I had decaf. But I don’t. So I made coffee with caffeine. I just really wanted the taste of coffee. I’ll deal with the sleep consequences later. How’s everybody’s evening going? Or, what time is it where you live? Two toasted slices of rye bread. Sprinkle with olive oil. 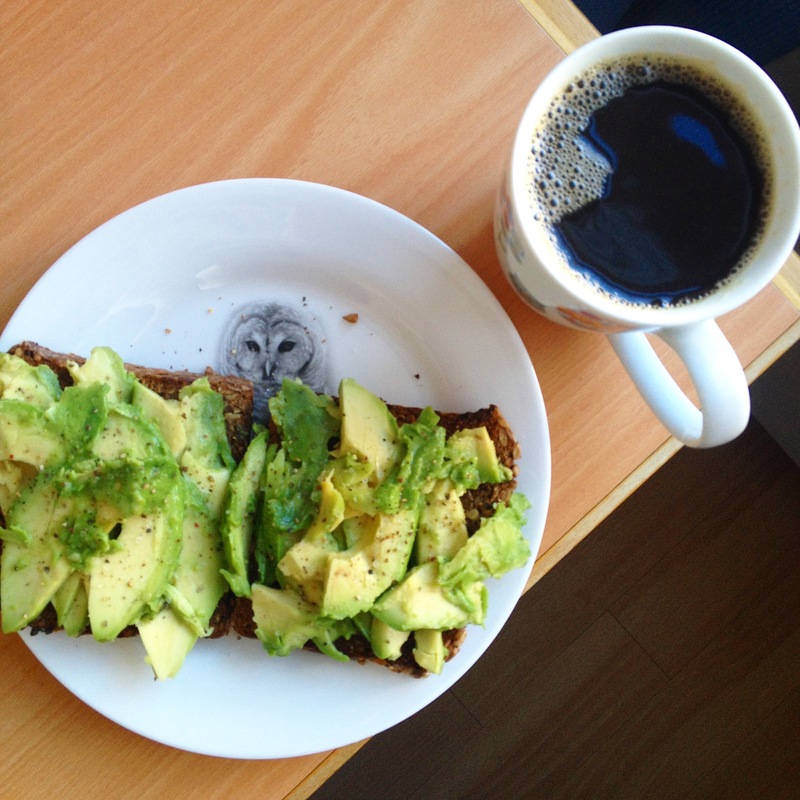 Half an avocado on each slice. Sprinkle salt and pepper on top. And of course: one cup of fresh, hot coffee on the side! You should definitely try this if you haven’t already. Super delicious!